Just in time for Christmas, I’ve dug up this marvelous painting by world-famous Octavio Ocampo. 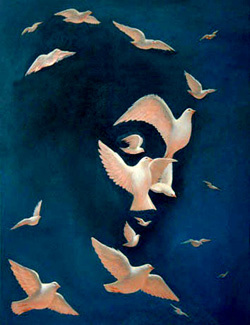 What at first seems as randomly scattered flock of doves, when observed closer makes a portrait of a beautiful female face. What you probably knew from before – Dove (domesticated Rock Pigeon, usually white in color) is a traditional Christian symbol of love and peace. According to the biblical story, after the flood, a dove was released by Noah in order to seek for land. When it returned back to Ark carrying an olive leaf in its beak, it then became clear to Noah that somewhere out there, flood has withdrawn and land has emerged! So, in spirit of Christmas, no matter which faith you belong to (and even if you don’t care much about religion), I wish you all a peaceful and merry Christmas! Stay well my friends, and be sure to remember -one person DOES make a difference. Only those “foolish” enough to think they can change the world, end up changing it! Thank you! I loved this illusion. And Merry Christmas to you, too! Merry Christmas! Happy Hannukah! Good illusion! Picture looks like Marilyn Monroe. just want to comment on your wish for peace. jeremiah 10:23 states, “I well know, O Jehovah, that to earthling man his way does not belong. It does not belong to man who is walking even to direct his step.” It is a foolish man that thinks a person can change the world. Try as they may it has never gotten better, it only gets worse. Jehovah God is the one that will step in and correct this world for humankind that want to serve him. Man has proven in the last 2000 years with all the different types of governments that peace does not come about by what man does. Trust in Jehovah with all your heart and do not lean on your own understanding…. (he will set things straight)Proverbs 3:5 please take this to heart. It looks the ones where the women have their eyes closed and open at the same time. This one is looking behind her. Which faith do you belong to, Vurdlak? Have a couple of wonderfull days! I actually saw the woman first. Where is an option to EMAIL these?? I do not use facebook. This site is useless to me if I cannot forward anything. @patricia paris – you could always copy the address and email that instead of having to be annoyed for not understanding the capabilities of the computer or device you are looking at.